“OVER THE PAST FEW HUNDRED YEARS, WE’VE LEARNED A THING OR TWO ABOUT BREWING GREAT IRISH ALE. NOW IT’S YOUR TURN. 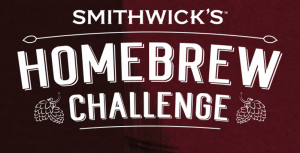 THIS YEAR WE ARE WORKING TOGETHER WITH THE NATIONAL HOMEBREW CLUB ON THE FIRST EVER SMITHWICK’S HOMEBREW CHALLENGE. A special time of year like Christmas calls for a special brew. They’re looking for a Christmas style ale that will stand out in the season – a perfect pint to enjoy with friends in your local while the fire blazes beside you. Think of a combination of aromas and flavors that suggest the winter season and an ale that you would love your family and friends to enjoy during Christmas. Two finalists will be chosen by an expert panel appointed by Smithwick’s. The two finalists will be invited to our Pilot brewery in November to create 1,000 litres. The two brews will be available in selected pubs and the winner will be announced at our event in the Pilot Brewery, St. James Gate, Dublin. The winner will be announced at an event in December and also receive a €1,000 cash prize. Smithwicks have just launched their winter ale competition. It’s a homebrew competition aimed at finding a “winter ale”, so essentially they are looking for something like a red ale, porter or stout. The only restriction is on what hops to use; Admiral; Magnum; Challenger; UK Goldings; Willamette; Saaz. You get 100g of Admiral hops just for registering as well. The prize is €1,000 plus the opportunity to brew 1000 litres on the pilot plant in St.James Gate and see your beer appear nationwide and in your local. There’ll be a swanky awards do as well and all the palaver you’d expect that goes with it if you win. Judging will be done by a mix of people including homebrewers and master brewers. It won’t be done to BJCP guidelines but rather be done subjectively, i.e. they’re just looking for a good beer. Kit beers are allowed and if they win the brewers will try to deconstruct the recipe and convert it to all-grain.